Fat Girl Fashionistas – here to stay? Reading The Times this week, I saw an article entitled, “The end of size zero” by Helen Rumbelow about a trend, called, “fatshion”, for blogging by, and about, plus size fa[t]shionistas (it’s behind a paywall but if you subscribe, follow the link). The article features Bethany Rutter, author of fashion blog Arched Eyebrow, one of the hundreds of plus size bloggers beavering away in the blogosphere, many of whom entered the first Curvy Blog Award organised by online plus-size retailer, Navabi who received nearly 300 entries from fat women’s fashion blogs. The winner will be announced tomorrow, Friday, 30 November 2012. 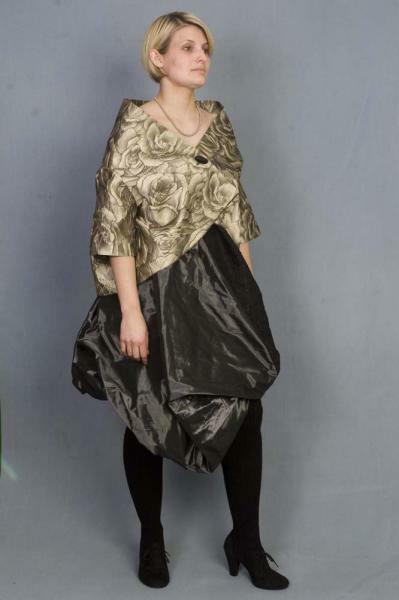 Go across to the Navabi Blog to take a look at the entrants and find out who won. Take a look at the whole Navabi offer whilst you’re there – they are a major online plus-size retailer, with a blog and an online magazine, and ship quickly to the UK if what you want is in stock. The Times article discusses the dichotomy between being ‘mad about fashion’ and ‘supposedly glamourising unhealthy lifestyles’. Wow. I was stunned. There are a lot of unhealthy lifestyles being lived – drink and drugs spring to mind – but did anyone ever see an article trying to understand why someone with a drink, drugs or even a smoking ‘problem’ would or would not be interested in fashion? Yet, somehow, there is surprise that women who are overweight might be interested in fashion and, er, the same things as non-fat women might like because of the ‘shame’? Hello, we’re plump and curvy, not another species. Do non-fat people really think this way? When Neneh Cherry performed on Top of the Pops eight months pregnant in 1988, it caused a sensation. Her form-fitting dress actually drew complaints to the BBC. It was a turning point. Now pregnant women can wear tight and bright because a big bump of flesh is just another part of the human condition. But fat women, it seems, not yet. Are fatshionistas having a kind of Neneh Cherry moment? Pretty unlikely, I think, more that normal women are just fed up looking at unrealistic images of women in the media and saying so out loud … blogging is an ideal medium for this. Should we be closeted up in shame, decrying our ‘fatness’ or just living life … like everyone else … and in public too? [Talking to] Kirsty Fife, 26, author of the Fatty Unbound blog, and Lauren Ding, 28, a social media marketing executive, and author of Pocket Rocket Fashion (strapline: “fat but patently not unfashionable”). Is what you do political? “Oh yeah!” they all say at once. Although their blogs are pretty much about glamour (“my blog is my happy place,” Ding says), the reasons behind them run much deeper. “If you’re fat, you’re forced to be invisible,” Fife says. …In an article for the Huffington Post this month, Rutter argued that fat fashionistas have to work so much harder to source and style their outfits, that it has made their look much more original. But how different are you if more than 50% of women are over a size 16? Those are big numbers … the new ‘normal’ in fact. And in that, they are role models and pioneers. Fashion always likes to brand itself a celebration of individual style, but it’s not, it’s buying what everyone else is from Topshop. I realise that, shopping with Rutter, I’m both appalled by and admire how her hand always dares to reach for the bold, bright, shiny and happy — the stuff I shrink from. In the changing room at Cos, I tell her I think she’s a brave dresser. She looks at me, one arm loaded with a lime-yellow frock. “I don’t feel brave, it’s not like I’m reporting from Gaza,” she says. And as she disappears behind a changing room curtain, I glance at myself in the mirror, wearing black more black, like a mime artist. What exactly am I trying to hide? We should all go our own way, and confidently. Really, that’s the conclusion of this article? Have to say, I’m not thinking of this as a Neneh Cherry moment any more than I think the Paralympics were a critical turning point for the integration of disability into the mainstream. I do think that the internet is opening up the world for all of us, the eyes and minds of some and making it a much better place for many. Happy fatshionista blogging. Although not “officially” a plus size I’m right on the line – unless you count couture clothing, in which case I am a plus size. I’m also under 5′ tall and in a wheelchair the majority of the time. The clerks at stores I frequent have often commented that the larger sizes fly out the door quickly. One flat out told me that their store didn’t want to stock more of the larger sizes so as not to be perceived as a “Plus Size Store”. Retailers and designers need to wake up. The average dress size in America is a 16 (firmly entrenched in “plus size” territory). They would do well to stop looking the other way when it comes to designing and carrying more beautiful clothing for us “fatshionistas”. Yes, it’s similar in the UK where being plus size and in a wheelchair seems to just ‘hurt the brain’ of most retailers. I have noticed that, online, plus sizes are booming both in blogging and retailing although again, in the larger sizes, nice things sell out quickly which indicates demand is underestimated. I really do think that online has the potential to be the market place for both plus sizes and the mobility impaired as, despite the sending back hassle if things don’t fit, it’s just so much easier and more pleasant to try things at home than to brave the high street or mall.